Just in case you’ve never really heard of Chantilly Whipped Cream before, know that it’s just a fancy term used to designate heavy cream that’s been whipped, sweetened and flavored with a bit of vanilla extract. Most people just like to call it Whipped Cream. Plain and simple. Let’s be honest, whipped cream is one of those essential basic recipes that you absolutely need to master in the kitchen — there are just so many recipes out there that call for it, either as a part of the ingredients list, or merely as a topping or garnish. And really, whipped cream; that’s super easy to make, right? Way too easy to even require a recipe, right? That make sense, I guess. If it weren’t true, then there would be absolutely no need for products such as Cool Whip or Ready Whip, right? 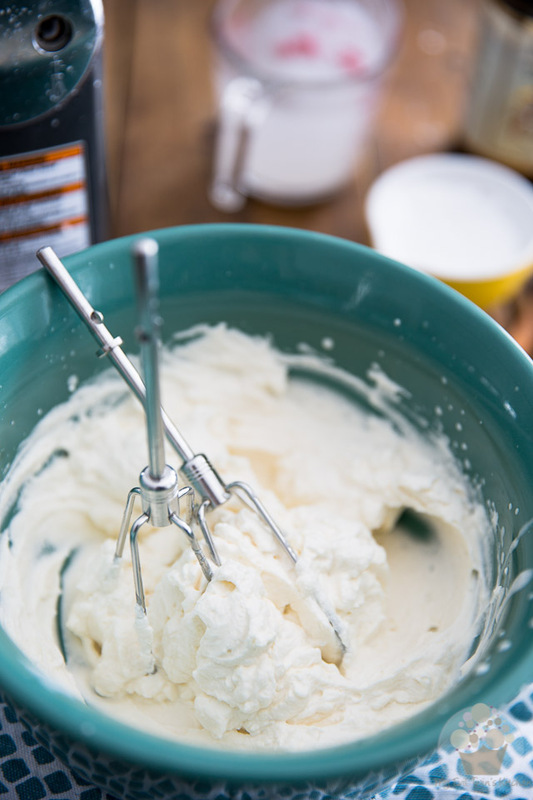 ‘Cuz really, making whipped cream from scratch takes the better part of what… 2 minutes, maybe? Seriously, once you know how to make your own Whipped Cream, you’ll simply never want to go back to the aforementioned products. 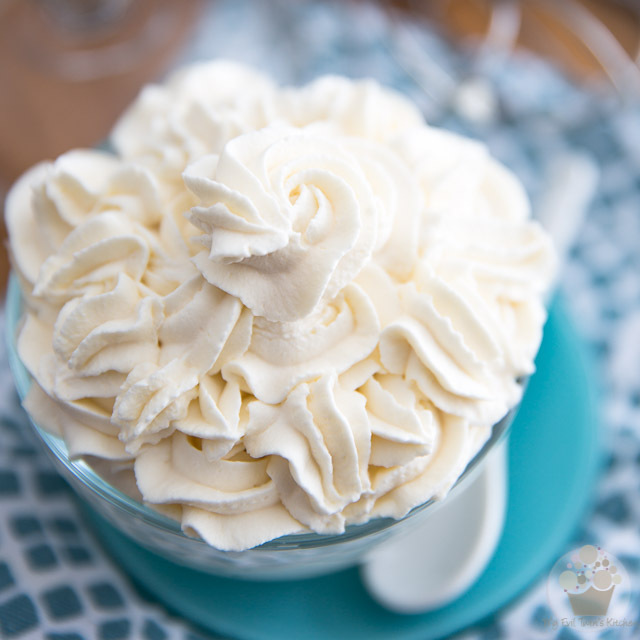 If you’re one of those individuals who are having a hard time tackling this basic recipe, allow me, if you please, to share with you a few step-by-step instructions, pictures and pointers to help you achieve the perfect Chantilly Whipped Cream every.single.time! 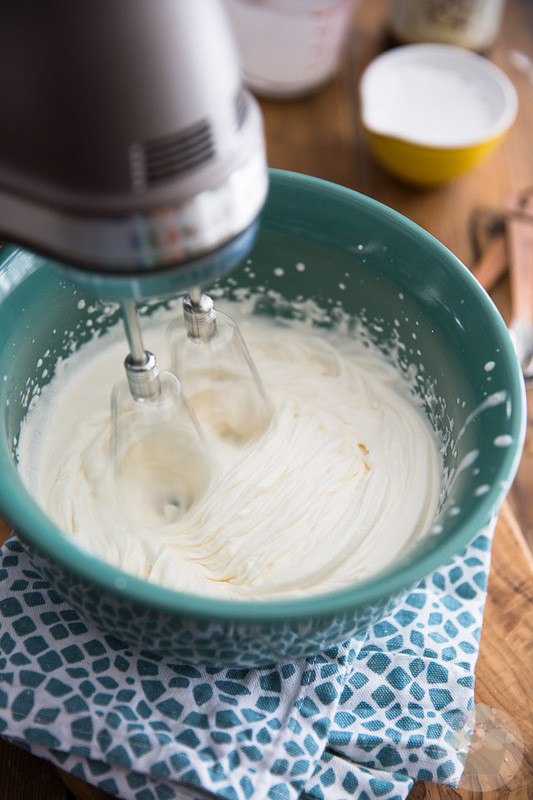 One of the first rules that you must obey when making whipped cream is that, for best results, you must work with cold ingredients and equipment. If you have to, especially during the warmer months of summer, stick your bowl and beaters in the freezer to chill for 15-20 minutes before you start whipping your cream. Also make sure to take your whipping cream out of the fridge at the last possible minute. And while we’re on the subject of cream, be certain that you get heavy WHIPPING cream. Don’t go using heavy cooking cream or old fashioned heavy cream. Always double check that it’s got AT LEAST 35% M.F. 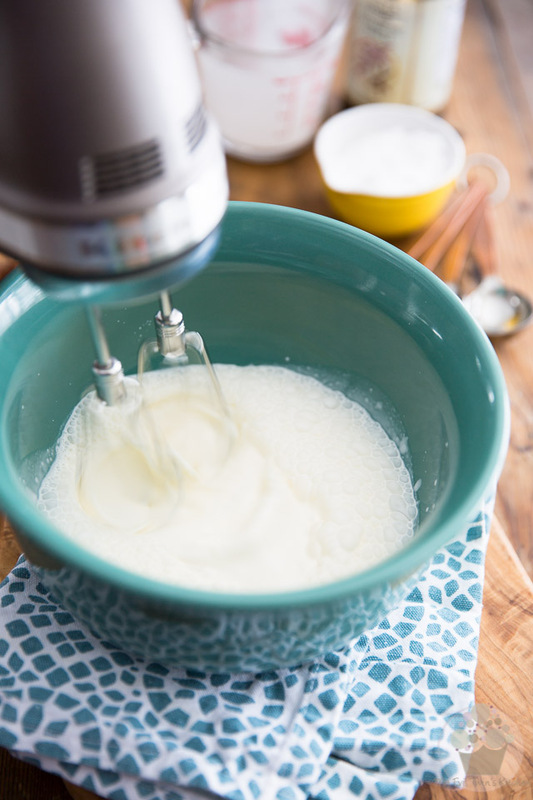 Lastly, make sure that you choose a bowl that’s large enough to accommodate the expansion of said cream (it will at least double in volume) as well as to contain the inevitable splatter. Pour the heavy whipping cream into the cold bowl and beat on medium speed until it becomes thick and frothy, about 1 minute. Most people will have you whip your cream on high speed but really, this isn’t ideal. 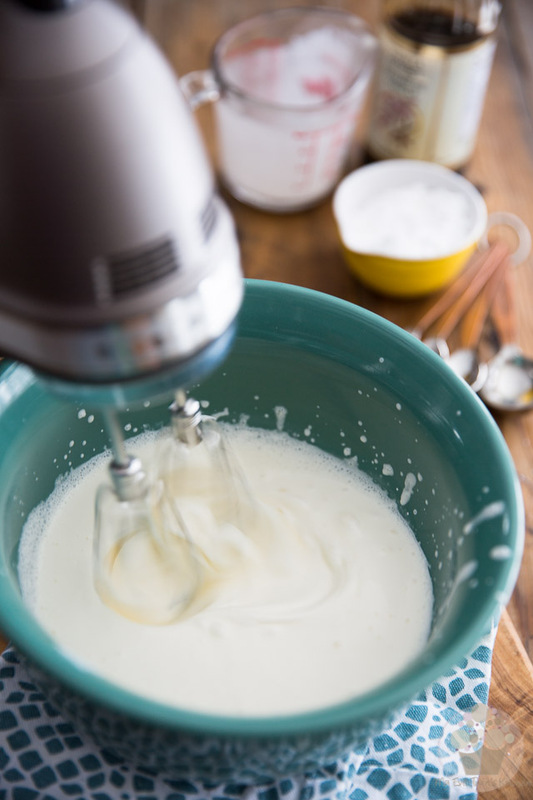 When I was in pastry school, I learned that whipping cream at medium speed will allow more air to get into it, resulting in a much lighter, fluffier whipped cream, not to mention the fact that you’ll get a little bit more by volume, too. At first, you’ll see hundreds of little bubbles form at the top of the cream. That’s what you want! The more bubbles, the better! You should be about a minute into the process here. Oh, and see what I meant about splatter? It’ll only get worse, too! When you get to the thick and frothy stage, that’s when you want to add the powdered sugar and vanilla extract. How much powdered sugar you add is really up to you, depending on how sweet you like your whipped cream to be; between 2 and 4 tablespoons is a good amount. And if you wanted to give a bit of a different flavoring to your Whipped Cream, you could most definitely go with a different kind of extract here, too. Lemon, coffee, strawberry, rum butter, pecan, caramel… name it! The possibilities are endless! You could even add a few drops of food coloring, if you wanted to have a little fun! Resume beating, on medium speed still, until the cream becomes real thick and the swirls and ripples left behind by the beaters start to hold their shape really well. 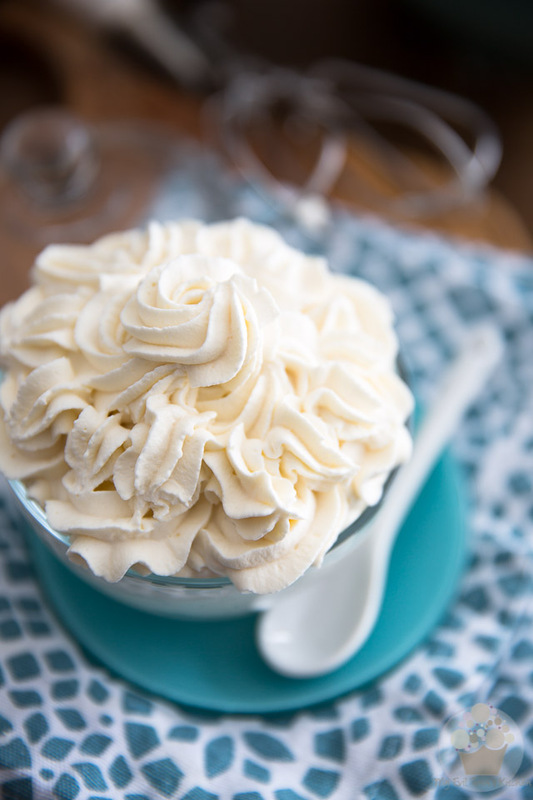 You could stop right here if you’re going to use the whipped cream as part of a recipe, or drop great big dollops of it by the spoonful over your favorite dessert. If you’re planning on piping your Whipped Cream with a pastry bag, though, you may want to keep going for just a few seconds more, to make my Whipped Cream just a tad firmer. Make sure that you do not over beat, though, as the cream will start to separate VERY quickly. And then you’d end up with sweetened butter and buttermilk. Ugh. No bueno. 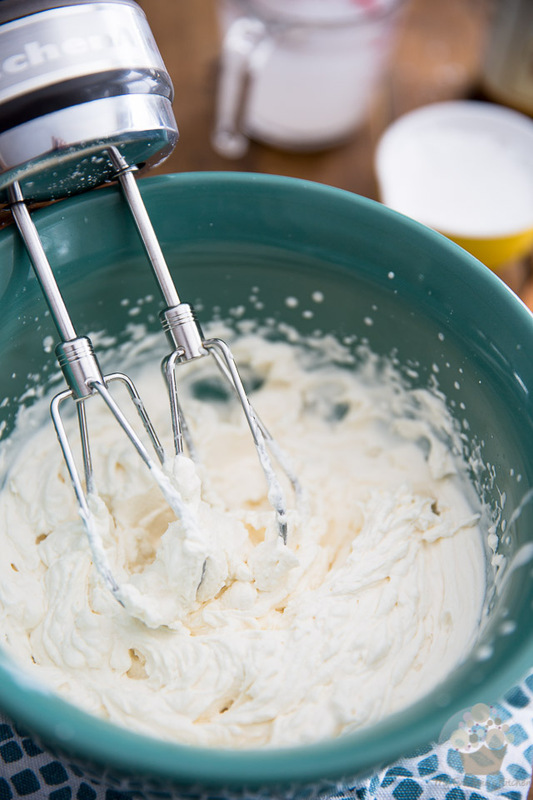 You’re always better off keeping your Whipped Cream on the slightly soft under-whipped side than whipping it too much, as there is absolutely no way to recover over-whipped cream. With a little bit of practice, you’ll totally get the hang of it and know exactly when to stop. 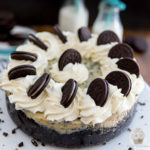 Preferably, you want to use your Whipped Cream as soon as it’s ready, but it can also be kept in the refrigerator until ready to use, for up to a couple of days. 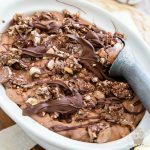 Just try not to eat if all by the spoonful, if you do that… store it way in the back of the fridge so you don’t get to see it every time you need to grab something from the ice box! For best results, you must work with cold ingredients and equipment. If necessary, stick your bowl and beaters in the freezer to chill for 15-20 minutes before you start whipping your cream. Also, make sure that you choose a bowl that's large enough to accommodate for the expansion of the cream (it will at least double in volume) as well as to contain the inevitable splatter. 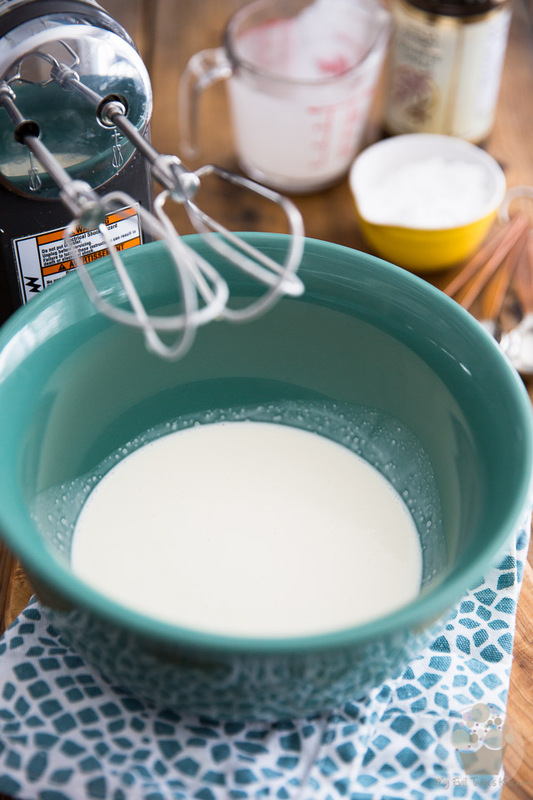 Pour the heavy whipping cream in the bowl and beat on medium speed until it becomes thick and frothy, about 1 minute. Add the powdered sugar and vanilla extract and resume beating, on medium speed still, until the cream becomes real thick and the swirls created by the beaters hold their shape really well. Do not over beat as the cream will start to separate very quickly. Use immediately or keep in the refrigerator until ready to use. Every time I make whipped cream after one day it turns to soup. What am I doing wrong? I don’t know…. But mine usually lingers a day or two- it does however get a little less fluffy. For starters, make sure that you whip your cream all the way, until it gets really firm and “tight”. If its super soft to start with, it will have a tendency to “deflate” much faster. Also too, keep it in the fridge uncovered. 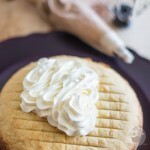 This will cause some of the moisture to evaporate and will ensure that your whipped cream stays nice firm. Just don’t go keeping it for too long like that though, as it will form a crust and sort of dry out after a while. 2-3 days usually works fine! I add pudding mix , alternating between the pudding mix and powdered sugar. It holds for days. Sorry, I didn’t see previous comment!!! 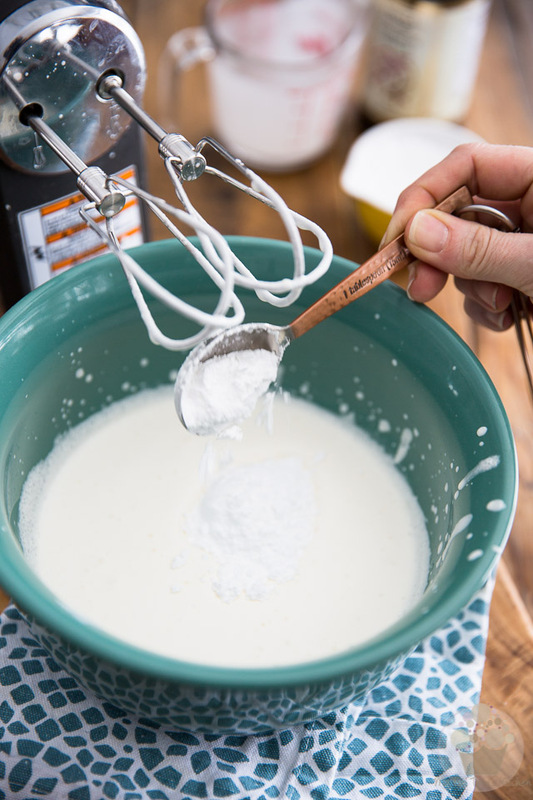 i have not done this but have read other posts that you need to stablize the whip cream by adding a small amout of instant pudding to make it last longer. I made this today for Thanksgiving and it was perfect! Everyone loved it. I won’t be buying whipped topping again! Thanks for the recipe! Love this! Will I be able to frost a cake with this and have it remain ok for several hours? Absolutely! Make sure to keep it in the fridge, though! Have you ever tried using Mexican Crema Table Cream in place of heavy whipping cream? I’ve read somewhere, that it whips up stiffer and holds its whip longer than heavy cream. Lovely Chantilly whipped cream and useful tips. You are amazing. Thanks. I’ll try it. I tried making a stabilized whipped cream frosting today but I got soup instead. The whipped cream got to a soft peak stage, but from there it only got more liquidy, never reaching stiff peak. The recipe called for mascarpone and heavy cream, sugar and vanilla. I watched the video twice before making it myself, and chilled the whisk and bowl from my kitchenaid stand mixer beforehand. The instructions said it would take “a while” to come to stiff peak stage and to “be patient”, but alas no dice. I don’t think I over whipped it because I would have ended up with butter, but instead I got soup. In your expert opinion, what do you think went wrong? Id like to debunk this before I try your recipe so I don’t end up with similar results. Thank you! Unfortunately, Debra, I can’t really attest as to what went wrong with a recipe that I never even tried myself, let alone create… I can tell you, however, that my Chantilly Whipped Cream recipe is practically foolproof. Just be sure not to over whip the cream, else you will end up with butter. Other than that, it’s a piece of cake!